I thought I was being so super creative pairing summer squash noodles with caramelized onions, but then I saw that I did the same thing with summer squash quinoa gratin. Oh well, but it actually is a really good flavor combination. 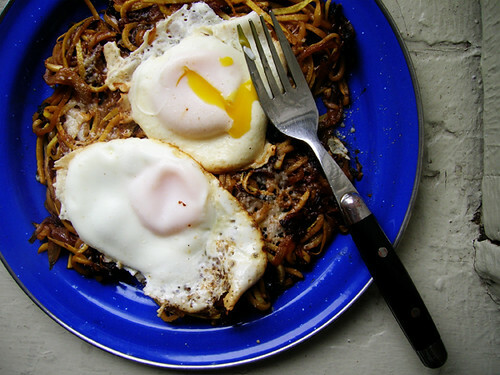 I realize that as it is fried eggs and vegetable noodles is a work from home breakfast, and not much use for folks who don't work from home, and adding a long step to caramelize onions makes this recipe really not very useful, but. If you are at home and you happen to have a huge sink full of dishes, you can slice your onion first and get it started in the pan over medium low heat, stirring occasionally, and by time all the dishes are done, you have caramelized onions. For summer squash I'm going with half butter and half olive oil, because I'm whimsical like that. Peel, halve, and thinly slice the onion. Saute the onion slices in a little butter and a little olive oil over medium low heat until caramelized, about twenty minutes. Meanwhile wash and trim the summer squash, then julienne them with a julienne peeler or with a knife if you have mad knife skillz or spiralize them with a spiralizer. Add the summer squash noodles to the caramelized onions, and saute over medium high heat until the noodles are separate and floppy. Put the squash and onions on an ovenproof plate, sprinkle with parmesan, and put the plate in the oven while you fry your eggs. Fry the eggs in a bit more butter and olive oil also over medium high heat. I crack my eggs in the oil, let them set a bit, then dribble in a little water from the kettle and cover the skillet for a couple minutes; this cooks the tops of the eggs without having to flip them or wait forever. Plate the eggs on top of the squash and onions.